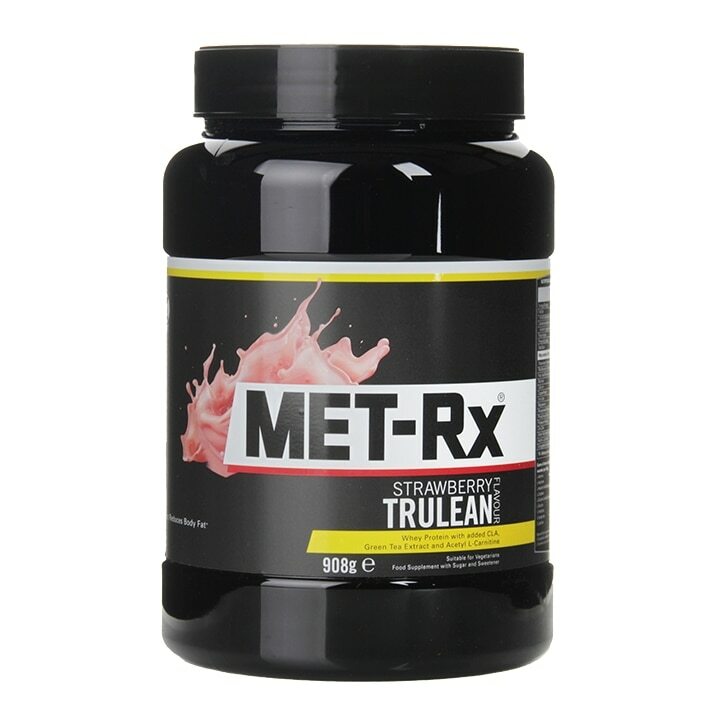 Use 2-3 servings of MET-Rx Trulean daily to help tone and maintain a lean physique. Add 2 x 70ml scoops (approximately 50g) with 260ml of ice cold water or milk and shake for at least 10 seconds. Ensure adequate hydration during and after training - Minimum of six to eight glasses of water daily. Protein Blend (Soya Protein Isolate, Whey (Milk) Protein Concentrate (WPC80), Whey (Milk Protein Isolate), Inlulin, Soya Fibre, Acetyl L-Carnitine, Conjugated Linoleic Acid (CLA) (Conjugated Linoleic Acid, Glucose Syrup Solids, Calcium Caseinate (Milk), Skimmed Milk Powder, Anti-Caking Agent (Silicon Dioxide), Antioxidants (Ascorbyl Palmitate, Mixed Tocopherols (Soya)). Cegepal Oil (Sunflower Oil, Glucose Syrup Solids, Milk Protein, Emulsifiers (Citric Acid Esters of Mono- and Diglycerides, Soya Lecithin), Antioxidants (Ascorbyl Palmitate, Mixed Tocopherols (Soya), Ascorbic Acid)), Strawberry Flavouring (Maltodextrin, Emulsifier (Acacia Gum), Natural Flavouring Substances, Flavouring Preparations, Anti-Caking Agent (Silicon Dioxide)), Emulsifier (Soya Lecithin), Buling Agent (Xanthan Gum), Red Beet Juice (Maltodextrin, Red Beet Juice Concentrate, Citric Acid), Maltodextrin, Sweetener (Sucralose), Green Tea Extract. Food supplements must not be used as a substitute for a varied and balanced diet and a healthy lifestyle. If you are pregnant, breastfeeding, taking any medications or under medical supervision, please consult a doctor or healthcare professional before use. Discontinue use and consult a doctor is advers reactions occur. Children: Close tightly and keep out of sight and reach of children. Contains Iron, which can be harmful to children in large doses. In case of accidental overdose, contact your doctor or nearest Hospital Casualty Department immediately. Diabetics/Hypoglycemics: Use only under a doctor's supervision because this product contains chromium which may enhance insulin sensitivity and may affect your blood glucose levels. Contains caffeine. Not recommended for children or pregnant women. Not intended for use by persons under the age of 18. Phenylketonurics: Contains Phenylalanine. Amounts greater than 250mg daily of Phosphorus may cause mild stomach upset in sensitive individuals. Do not use if seal under cap is broken or missing. Met-Rx Trulean Strawberry is rated 5.0 out of 5 by 1.